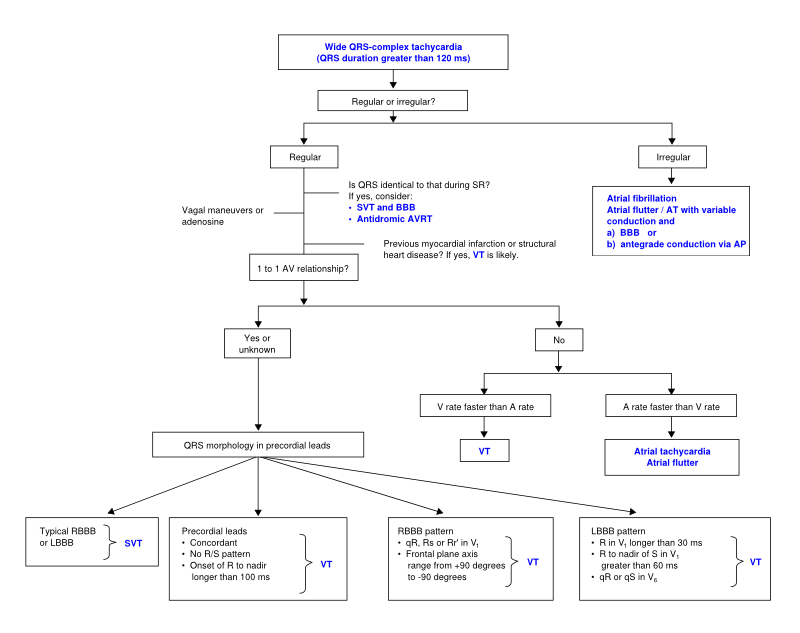 Brugada algorithm (below). This is the most commonly used algorithm. SN 89%, SP 59.2%. 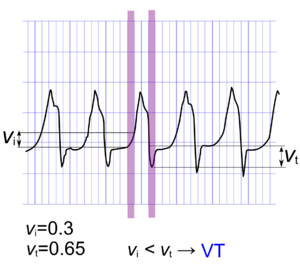 The lead II R-wave-peak-time (below). Sensitivity 60%, specificity 82.7%. 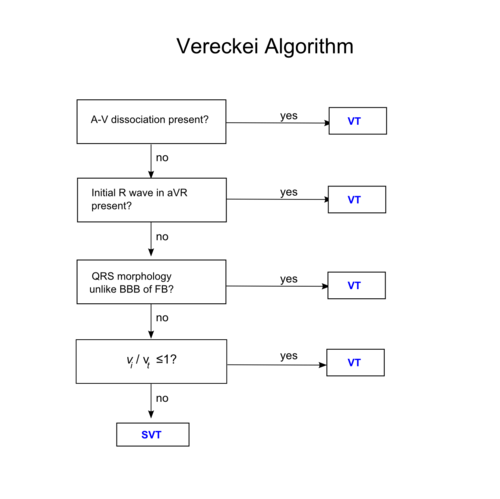 The aVR algorithm (below). Sensitivity 87.1%, specificity 48%. The Bayesian algorithm. This calculates a score based on 19 morpologic features. Sensitivity 89%, specificity 52%. The Griffith algorithm (below). Sensitivity 94.2%, specificity 39.8%. In 2010 Joseph Brugada et al. 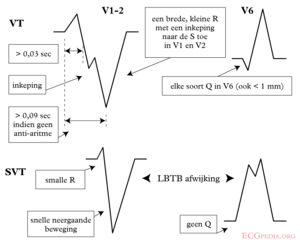 published a new criterion to differentiate VT from SVT in wide complex tachycardias: the R wave peak time in Lead II . 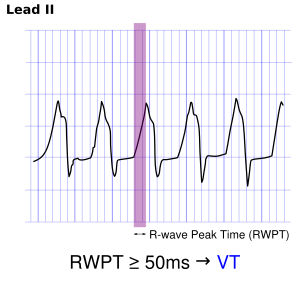 They suggest measuring the duration of onset of the QRS to the first change in polarity (either nadir Q or peak R) in lead II. 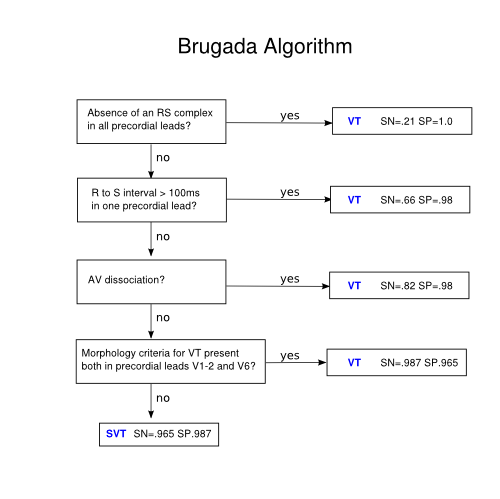 If the RWPT is ≥ 50ms the likelihood of a VT very high (positive likelihood ratio 34.8). This criterion was successful in their own population of 163 selected patients and is awaiting prospective testing in a larger trial. ECG from the same patient in sinus rhythm. 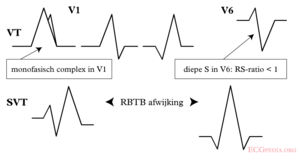 The QRS complex is very similiar. This page was last edited on 24 February 2013, at 19:01.